May 13 Can A Nozzle Provide The Breakthrough Indoor Farming Has Been Waiting For? Can A Nozzle Provide The Breakthrough Indoor Farming Has Been Waiting For? A British company says it can greatly extend the range of crops grown in indoor growing formats beyond the established leafy greens and herbs. Discussions on the potential of urban and indoor farming invariably mention the need to feed a growing global population, forecast to reach 10 billion by the middle of the century, against a backdrop of climate change and depleted land and other resources. But so far, for technical and economic reasons, the movement has largely targeted leafy greens and herbs — relatively high-value but low-mass, low-calorie crops. Indeed, one successful London grower specialises in "micro-salads" sought by higher-end retailers and restaurants that, for all their merits, are unlikely to displace much conventional farming or address food supply in the developing world. This may be about to change though, thanks to a technological breakthrough by a British company. West London-based Airponix says it has overcome an obstacle to growing more high-calorie crops, thanks to spray nozzles adapted from printers. Aeroponics is a variant of hydroponic growing in which plants’ roots are exposed to a nutrient-rich mist within a chamber, rather than sitting in a circulating water-and-nutrient solution. Like other indoor growing technologies, aeroponics has so far found a market in hobby growing more readily than in commercial horticulture, with several UK suppliers offering variants on the format on a range of scales. 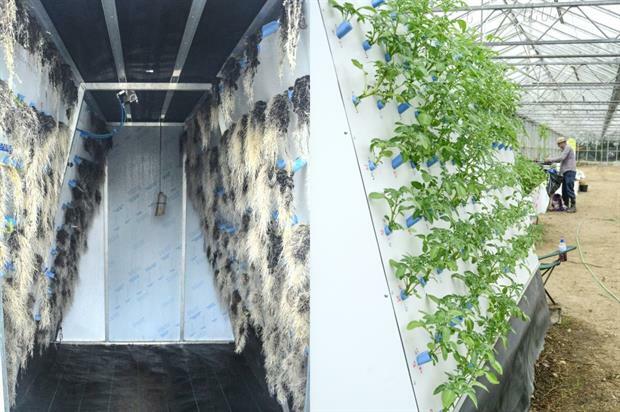 That said, aeroponics is also the basis of what is claimed to be the world's largest commercial indoor growing facility, run by AeroFarms in a former steel mill in New Jersey, USA, and employing its own multi-tiered variant of the technology in combination with LED lighting to produce up to 900 tonnes of fresh produce a year. But this too grows only salads. What has so far restricted aeroponic growing to such crops, Airponix explains, is that the size of the droplets in the chamber causes them to coalesce, precipitate out of the air and form larger droplets on the roots, inhibiting the uptake of nutrients and encouraging the growth of wastefully long roots. To address this, Airponix has worked with a developer of piezoelectric inkjet technology to engineer print heads that can emit nutrient-rich "fogs" — a term that Airponix contrasts with the "mists" of conventional aeroponics — comprising droplets that can be greatly reduced in size to below 20 microns, and indeed optimised to the needs of the particular crop. These print heads also require less energy than other fog-making methods, are highly reliable and easy to install or replace under field conditions, says Airponix. This allows the technology to extend into growing soft fruits, grapes, brassicas, root crops and even the cereal staples of rice, wheat and maize. Airponix says its own small-scale potato-growing trials show typical yields are around 50 times greater per hectare per year than from conventional farming, without the expense of heavy machinery, diesel or crop-protection products. Rather than capital-intensive glasshouses, or tech-heavy enclosed controlled growing environments, the growing system can be housed in simple polytunnels. Airponix chief executive Michael Ruggier says: "Trials of our breakthrough technology show that we can produce crops such as potatoes with lower production costs and higher quality, competing strongly against conventionally grown new baby potatoes." He adds: "The potential cost of the system is very low and requires little energy to operate. Manual labour is also greatly reduced because harvesting is a simple, clean process and root crops don't need washing." Ruggier co-founded the company in 2016 with John Prewer, now its technical director, who developed and patented an early form of aeroponic growing more than 40 years ago, while its horticulturist and operations manager Barry Robertson was previously head of controlled environment horticulture at the John Innes Centre. The technology has already garnered awards, including being named the overall winner in the Rushlight Awards for novel, clean technologies in January. Airponix has now equipped a 1,000sq m glasshouse in Norfolk with its A-framed potato-growing units for development, testing and demonstration, thanks to a half-million-pound loan from Centrica Innovations. The glasshouse incorporates further growth-enhancement techniques such as imparting an electrostatic charge on the droplets for better adherence to and absorbption by the plants’ leaves and roots. A smart, fully automated system, operated by a mobile phone app, is also being developed. The aim initially is "to demonstrate the yield quantities and the costs associated so that next year Airponix will be in a position to licence the technology", says a company representative, adding that it will also provide samples of the first crop, due next month, to supermarket retailers for evaluation. "The type of potatoes that Airponix can grow and harvest are unlike anything currently being sold anywhere and has huge potential in both the fresh-produce and snacks categories," he points out. The company also hopes that selling this year’s remaining crop will provide revenue to enable it to extend its own glasshouse space and growing facilities next year. May 13 Hydroponics, The Future of food?